match not shown on stream. Lady Maravila beat Chik Tormenta with a Spanish Fly in Tormenta's debut. Shani pinned Faby - the first time Faby's been pinned all year on TV. Faby went after Shani after the match. Taurus again showed up to attack an Apache enemy, spearing Shani. Jack Evans made his return as a surprise wrestler. La Mascara & Maximo had issues after the match and a vignette before the match. 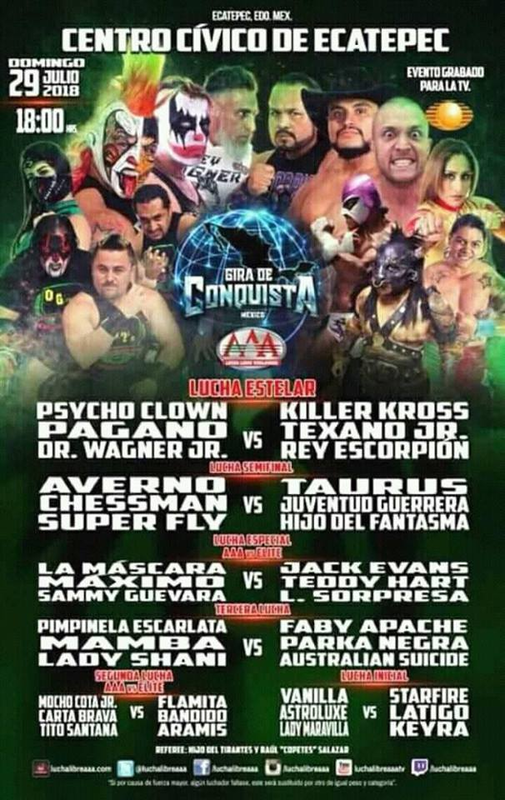 Mascara doesn't think Maximo is taking things seriously and may be going rudo. 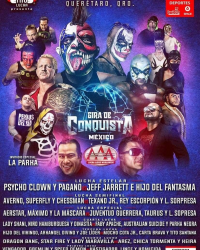 Fantasma beat Psycho Clown after a guitar shot in a match which also saw Juventud Guerrera and Hijo del Tirantes get involved. Team AAA (Faby) vs team ELITE (Zeuxis). 9:46, Faby pinning Zeuxis when Zeuxis had a shoulder up (finish was messed up). Lady Shani attacked Faby with a kendo stick, Faby bled a tiny bit, Faby hit Shani with a chair, and Hijo del Tirantes very obviously bladed Shani. Team AAA (Alvardos) vs Team ELITE (Traumas). 5:07. Traums submitted both Alvardos after Maximo screwed up again. 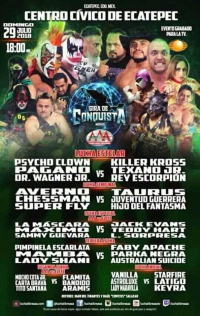 La Mascara seems to be splitting from Maximo and heading to a team with Fantasma. Mamba came to the ring to console Maximo after the match, then Kevin Kross and Brian Cage destroyed everyone. The rest of MAD came out to taunt the fans. Vampiro interrupted, trashed Konnan, and was beat up by MAD. OGT made the save. 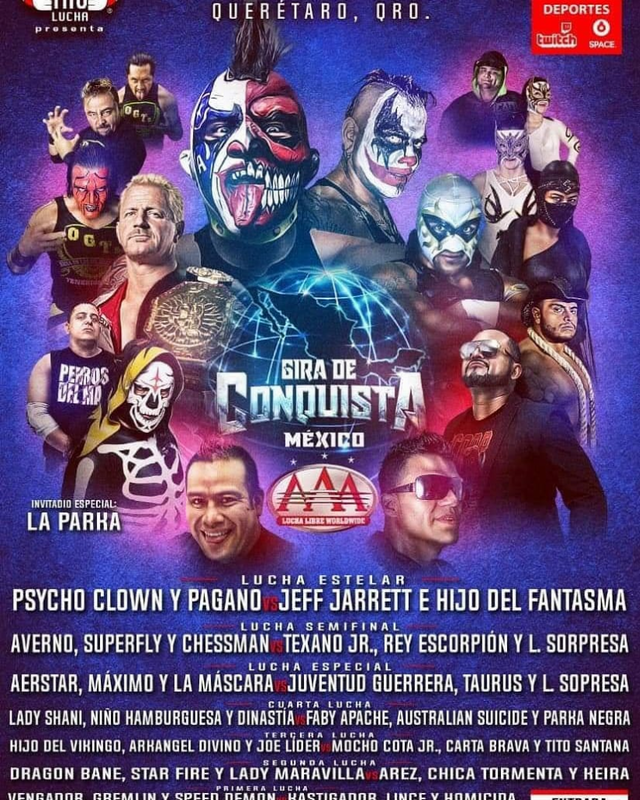 Vampiro declared himself the biggest and best OGT of all suggested they team up to face MAD. Team AAA (Aerostar) vs Team ELITE (Taurus). 11:05. Argenis was the surprise wrestler and was pinned by Taurus. Parka Negra ran out to attack Hijo de LA Park, then was brushed aside as Cage & Kross ran out to beat everyone up again. Team AAA (Pagano) vs Team Elite (Jack). Moved down a spot. 12:38. Jack Evans pinned Joe Lider with a 630 senton. Pagano was injured attempting to take a Destroyer on the apron and landing on the floor instead. Team AAA (Texano) vs Team Elite (Magic). 9:40. Kross & Cage ran in for a third time, this time during the match. Their attack was not called a DQ, and neither was La Parka leading a group of AAA people no otherwise booked for the show to back them off. Murder Clown and Dave the Clown grabbed Cage & Kross but Taurus (attacked earlier by MAD and seemingly not part of that group to this point) saved them. Texano pinned Golden Magic after a chair shot. This match was declared for the World of Warcraft championship and Escorpion & Texano were awarded a belt for this win. 20:31. Team AAA (Wagner) vs Team Elite (Park). Puma King was the surprise wrestler. Wagner appeared despite saying he would not. LA Park & Psycho Clown fought for most of the match, with LA Park pinning Psycho after Fantasma betrayed him with a foul. Elite won the show 4-2. 7:42. Mocho Cota pinned Aramis after a top rope elbow drop. 9:48. Shani rolled thru a huracanrana to beat Faby Apache. Taurus attacked her post-match, and Faby took Shani's mask. 13:07. Puma was the surprise wrestler, and pinned Maximo with a casita after he and La Mascara had issues again. Mascara slapped Maximo and Pimpi & Maximo made the save. 14:15. Fantasma Thrill of the Hunt on Averno after Hijo del Tirantes stopped a Devil's Wings attempt. 19:12. La Parka replaced Dr. Wagner. Psycho Clown beat Rey Escorpion with a torito after Murder Clown, Hijo del Fantasma, Juventud Guerrera and Jack Evans all got involved. Fantasma unmasked Psycho and Murder post match. Event Notes: 6:00 pm start.